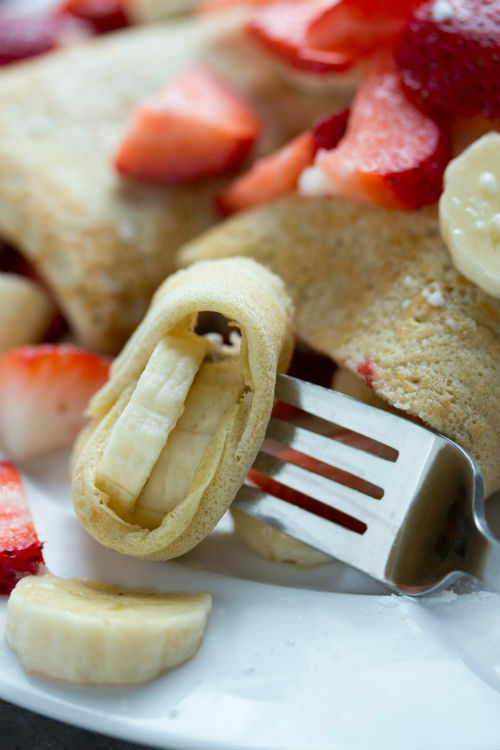 It’s not a special occasion at this house unless it starts off with these basic crepes stuffed to the brim with strawberries and bananas. Oh, and don’t forget to spread on some coconut oil first. 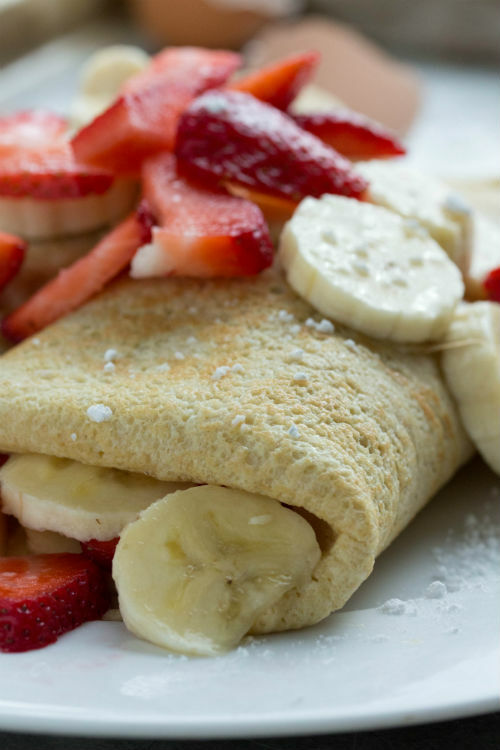 Is there a more heavenly breakfast than crepes? No. The answer is no. I planted four strawberry plants over a year ago. When purchasing, the helpful plant-man (I’m sure there’s a much more mature name for him) instructed me to focus on establishing the roots really well and to not expect any strawberries during the first season. I only listened to half of his instructions. I established the roots really well and then anxiously watch and waited… watch and waited… and never got a single strawberry. Ugh. Well, it’s strawberry season and my plants are blossoming! I’ve already picked like 5 strawberries. Yeah, I’m rockin’ this strawberry garden thing. And just in time to stuff them into my crepes. Who wouldn’t love the convenience of walking into your backyard and picking fresh strawberries? Unless you hate strawberries. Do people like that exist? Anyway, I dream of a day when I do the same thing for fresh eggs. Just fresh eggs… without the chickens. Fresh eggs taste SO much better! If you don’t have access to fresh locally produced eggs, go certified organic, cage-free, or free-range. Once you crack a quality egg, you’ll immediately notice a difference. The yoke is a bright, vibrant yellow and egg whites are clear. Try it… you just might like it. Am I preaching to the choir or do I need to share my undying love for coconut oil once more? It’s time to officially bid farewell to butter. Butter doesn’t treat you nearly as great as coconut oil. Coconut oil continues to impress me. When the medium-chain fatty acids metabolize (stick with me), they are used for a quick source of energy. Benefits include having therapeutic effects on brain disorders like epilepsy and Alzheimer’s, helps you burn more fat, helps you fight infection, and lower your risk of heart disease and Type 2 Diabetes. Just rip off the bandaid and be done with butter already! Whenever you would normally spread on butter, just spread on coconut oil instead. 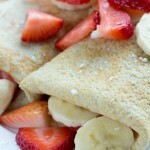 I add a little honey in my crepe recipe so no need to pour on syrup or add some other sugary option. 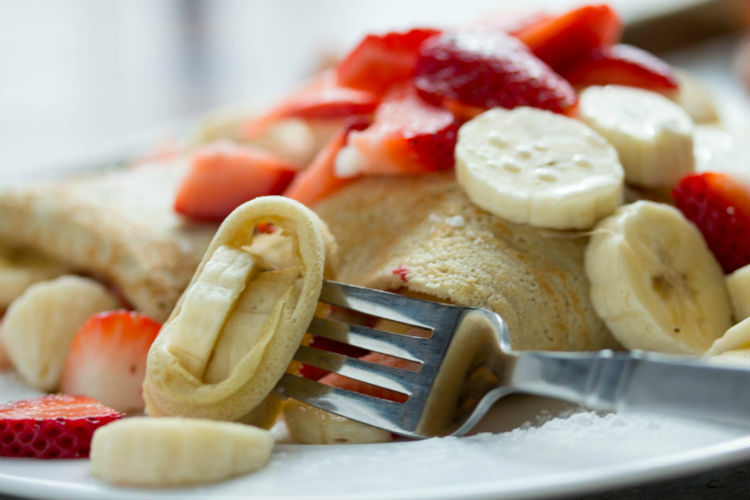 Once the crepe is freshly cooked, I generously spread on coconut oil and top with fresh berries and banana slices. Roll that baby up and eat away! Well, enjoy your crepes! One last tip… they always taste better when served in bed. In a blender, combine all ingredients and blend for 30 to 45 seconds until blended well. Batter will be light and fluffy. Heat a medium-size frying pan over medium heat for 2 to 3 minutes. Spray with cooking spray and pour about 1/4 cup batter in the center. While holding the pan, tilt pan in a circular motion until bottom is completely coated. Cook for about 1 to 2 minutes until top starts to bubble and flip using spatula. 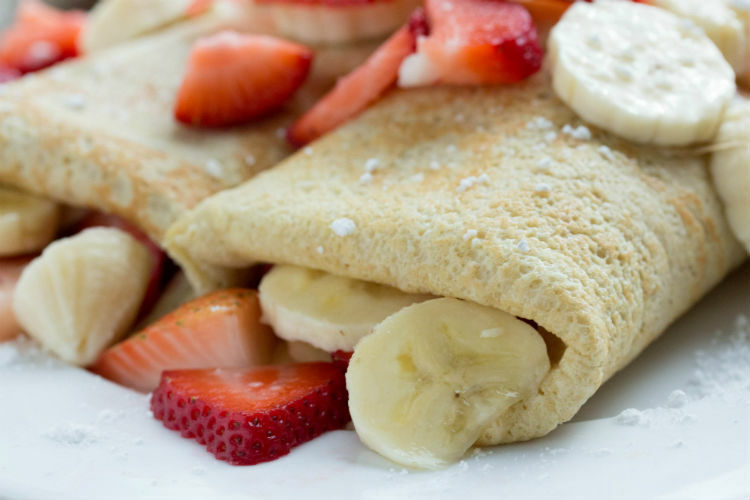 Cook for an additional minute and then remove crepe and continue the process until batter is gone. 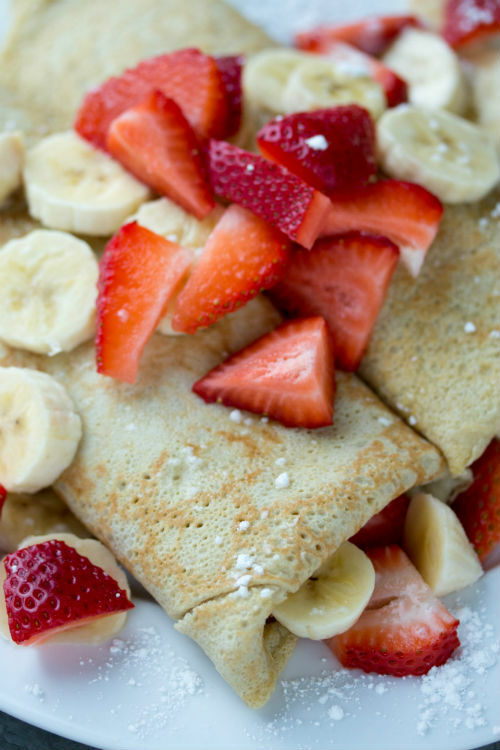 Spread coconut oil generously over crepe and fill with fresh berries and banana slices.